Mat Sinner is both an icon and legend in the German, and the larger European, hard rock and heavy metal scene. 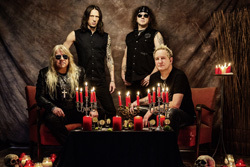 Cranking out music since 1982, Sinner is an industrious and prolific musician and producer whether through his namesake band, the heavy metal heroes Primal Fear, or the Classic Meets Rock extravaganza, to name only a few. It's his original band, Sinner, which gets the push this Spring with the latest, and if I counted right, eighteenth studio album, Tequila Suicide. 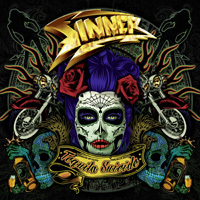 Needless to say, Tequila Suicide is pure Sinner, expertly crafted melodic hard rock with a definitive metal edge. It's a familiar, even comfortable, motif that you expect, something like settling into your favorite easy chair. Sinner himself leads with his beefy vocals and hefty bass lines. Rhythm, riffs, and leads come from twin guitar harmony. And flaming guitar solos are never sparse across any Sinner album. Leads fly with some fury. The song arrangements bristle with the trustworthy and necessary elements of melody, harmony, groove, and then are liberally spiced with catchy refrains. Off to those songs then for a sampling of what you can expect. 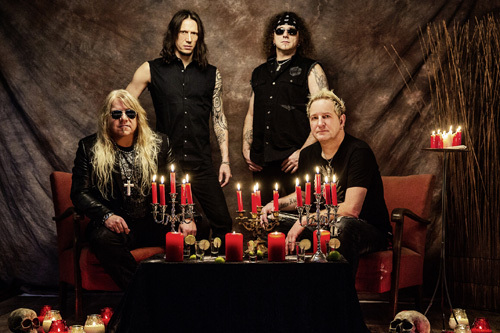 Go Down Fighting kicks off the album with a bluster of hard rock in a speed metal wrapper, and may remind some of Sinner's very early material. Dragons has a very strong bass line to start, then easily slides into a melodic metal groove. We all know how influential the blues was to the origins of rock n roll. Sinner taps into that with Sinner Blues, where the guitar lines sing sweetly and Sinner himself delivers some whiskey soaked vocals. Loud & Clear moves by some very strong riffage leading the way, and once more blending melodic hard rock with metal. Perhaps my favorite song here was Road To Hell. Between the timbre of the riffs, the groove of the bass and drum line, and Mat Sinner's vocals it sounded like a Thin Lizzy song. The album concludes the AOR accessible sound of Dying On A Broken Heart, something of milder and melodic anthemic rock ballad. The conclusion is a simple one. Once more, with Tequila Suicide, Mat Sinner and company have created a solid and entertaining album of metal infused melodic hard rock. I wouldn't expect anything less. Recommended. Once more, with Tequila Suicide, Mat Sinner and company have created a solid and entertaining album of metal infused melodic hard rock. I wouldn't expect anything less. Recommended.